​"There is a human heart the size of a fist inside of a jar." 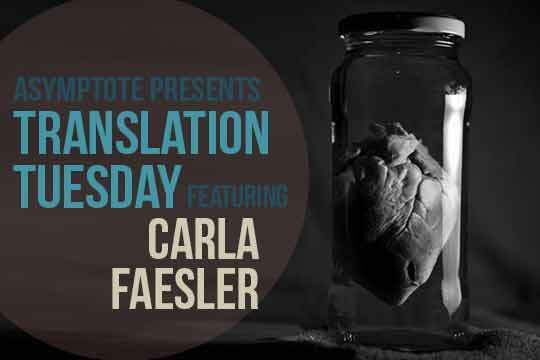 This glimpse into a new work by Carla Faesler offers an intriguing portrait of a married couple’s life and the spectre of their daughter, memories of a deceased mother, and a heart preserved in a jar. This excerpt seems to almost represent a cross-section of the story, focusing on one particular, seemingly normal day, yet with flickers of the past as well as into the future. The ending leaves us unsettled, but wanting more—we’ve become witness to a family’s mysterious secret, and we won’t be let go just yet. Febe, Larca’s mother, swallows her pills in the morning. Her circulatory system pumps the pharmaceuticals in minutes. Only then can she cook breakfast. When the effect peaks, she’s finishing her second cup of coffee. Larca walks to school hand in hand with Celso, her father, while Febe, engrossed like a hen, perches in her armchair, purveying a section of foliage out the window, a bit of sky, the fraction of a lamp post, to wonder how her husband, after dropping off their daughter, can walk to the hardware store and hoist the storefront’s heavy curtain under the constant watch of the guards. The physical force flushes red Celso’s face, supplied with blood by a network of fine veins. Then Febe, pallid, stands to fix her hair and slip something on in time for her husband to come home. Once he’s climbed the stairs, they greet one another with the warmth of a hand resting on a shoulder or the idle motion of clothes settling. Immediately then, two mannequins long out of fashion go down the white wood stairs. They drive to the market to buy food, and they check up on grandma’s house, which is really the house of Cristina, Celso’s dead mother, where everything remains unchanged thanks to Aurora who, despite her ponderous age, has held to her thrifty ways. They leave behind some groceries and the daily request that she resist the cloisters that have her walled in, consumed. It’s not that there are ghosts, with the family legend there would be enough dead to populate a country, it’s Aurora who frightens herself, the terrible appearance of her varicose veins, her wearied insides burdening her with the notion that she won’t ever disappear.